How To Make Your Resume Look Professional? A professional resume is consistent, clear, effective, concise and legible. As one talks about professional resume it is the one that is error free which include the typos and the grammatical mistakes. If you are trying to create the best professional looking resume you should start with being consistent. Legibility is another feature that will make your resume easily comprehensible to the employers. When you blend in little extra efforts to prepare the resume it will look extra professional making you appear in front of the recruiters proficient. 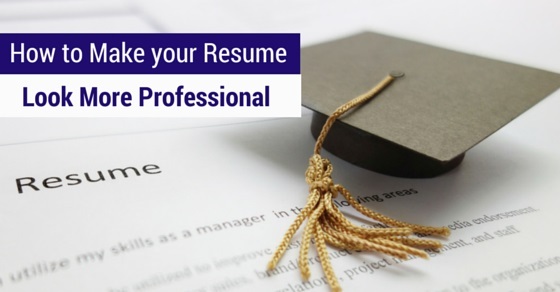 Stated below are few tips to help you make your resume look more professional. Choose a resume type that speaks for your proficiency. There exists numerous variety of resume that are employed for applying for job opportunity. According to your situation pick a type. You can choose a functional or chronological type or a combination of both or a targeted resume. When you review the samples of resume you get knowledge on what will work for you. There are samples for almost any job seeker. You will get ideas to form a professional resume. Only add information that is relevant to the job title. It is improbable for a professional resume to have excess information that is not related and will leave the employer to spot relevant details that make you capable, which will not be appreciative. It is very critical to have concise resume to directly convey your skills. You need to focus on asserting the results you have accomplished. It is very beneficial when you display the facts that show your hard work and the outcomes. When an employer glances at your resume with the track of achievements it is very likely that they will believe in you as a potential employee. When you use keywords that are essentially used in the industry you are striving to get in, your resume seems more professional. This also shows that you are aware of the lingo used in the industry. And it displays that you know how to apply the terms duly. To be concise and help the reader of your resume to quickly and effortlessly get a thorough idea about you, you need to use bullets. Cut out words that are unwanted and use bullets for your skills or the job titles or achievements. From the piles of the resume employers will find your resume precise and painless to scan. Your resume is most probably to be skimmed. Since numerical are notable highly than texts it will attract reader’s attention. For illustration, “increased sales by 90%” is an account of your results that is wrapped with the number to draw interest. Creating a resume that is believable is fundamental. Be sure to only add facts and not elaborate on your skills. It is very easily spotted by professional employers when a resume is filled with sycophancy. Remember you want the resume to land you for an interview which is only possible if you include reality. Sometimes the objective section explains that you are looking for a specific job position. It can either be obvious to the employer or can change his perspective of you as a potential employee altogether. It is senseless to add this section if your objective is relevant to the position you have applied for. Evade cliché words that are common amongst all the resumes. Words that are used to explain your previous work experience like “responsible for”, “developed” or “successfully”, etc. If you hope for your resume to emerge professional you have to play around with words that are uncommon or phrases that stand out. Do not send the same resume to all the companies you are applying to. You must alter according to the distinct job descriptions stated for each job title and according to various companies. If you had gaps in your career it will be safe to justify the reason for those in your resume. Do not leave behind the readers of your resume hanging wondering what you did in the one or two years of gap. It is better to account the reasons and explain the gap. Stylized fonts, decreases the readability of your resume. You should have consistent font and which is simple like the Times New Roman font or the Helvetica and keep the font size 10 pt to 11pt. It displays your professionalism when you exercise this tip. If you are dispatching the cover letter and the references along with the resume, you have to make sure they all match. You have to use the same variety of paper while printing them, employ the same font consistently and your writing should convey that it is all coming from a single source. By this means you demonstrate your professionalism. It is not required adding religious information on your resume. It unlocks all platforms to discrimination and it is not just that you are going to be discriminated however this is very unprofessional for your resume. The industry perhaps has a particular form of resume which has developed into the standard. Aim to stick by those conventions. In case a prospective recruiter is in quest for an employee within your industry, perhaps they will be searching for a resume in the conventional form, having standard certifications as well as terminology to verify that you truly are recognizable with the industry. One who has great experience in your field will be able to guide you and advice according to the professions customs. It can unquestionably combine to your resume to become visible as extra professional. It is easily recognized by the recruiters when someone else has written the resume for the candidate. Thus you can definitely take assistance but do not opt for making the professionals write the resume for you. Experiences that have become old and irrelevant are not needed. You possibly have fall upon many other opportunities and jobs that have increased your experience and are relevant to the job you are currently applying for. You can add a straight forward, firm and adamant statement that describe you. Keep a particular position in your head and effectively place the statement under your name and contact information on the top of the page in all caps. Be certain not to state an objective. You should not add negative facts about previous jobs or the employers. Only stay on to the career’s details. Your resume will turn out to be dull if you keep adding the responsibilities. Sometimes even the employers know the extent of responsibility that a position can hold. However when you supply additionally on the accomplishments as you carried on with your responsibility, it forms an interesting site for the potential employer. These verbs draw attention easily and directly communicate your experience and previous responsibilities. For example, trained, strategized, enforced, managed etc. Most of the time employers skip this section to scan over experience section which elaborates with the help of context about what skills you applied and hold. Thus you may like to keep this section concise and short. You can just proofread the resume for spelling mistakes or grammatical errors. Check for the spellings of the company’s name, check whether the reader can interpret your statements with the help of a fresh eye and you may take help of your friends or mentors to check the resume for any type of errors. When you have a hard copy of your resume to be submitted ensure that the resume is printed on high quality of paper. It ought to be adequately thick. When you are submitting the soft copy (electronically) confirm that you save it as PDF. It not only exhibits professionalism but also ensures that the format of the resume will be as you intend it to be. The Word document formats at times changes the format of your resume in the reader’s computer. When you create a resume that is polished and professional, your chances of securing an interview becomes high. The employers receive a vast number of resumes and they are not to be blamed if they ignore or put down resume that has a minor blunder. Thus you have to check and proofread more than two times, take professional help and remember to save the resume in PDF format unless another mentioned. Your resume looks professional when you do not add more about your interests and objectives but considerably mention by marketing yourself on what you can perform and contribute for the industry and the potential employer’s success.